Wondering what to have for dinner? 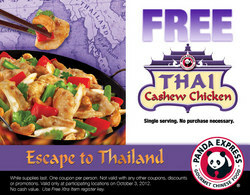 How about a free order of Thai Cashew Chicken Breast from Panda Express? The coupon (at right), is good today (October 3) only.